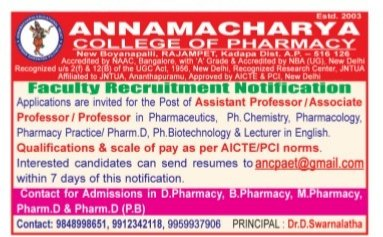 Annamacharya College of Pharmacy, Kadapa has advertised in the SAKSHI newspaper for the recruitment of Teaching Faculty- Professor / Associate Professor / Assistant Professor / Lecturers jobs vacancies. Interested and eligible job aspirants are requested to apply within 07 days from 26th June 2018. Check out further more details below. About College: Annamacharya College of Pharmacy was established in the year 2003 by Annamacharya Educational Trust and offering D.Pharmacy, B. Pharmacy, M. Pharmacy and Pharm D courses. The college admitted its first batch of students in the academic year 2003-04. The college is located in pleasant locality which is nearer to Thallapaka, the birth place of “The singing saint Annamacharya” on Chennai-Mumbai highway and well connected by road and train. How to Apply: Interested and eligible candidates are requested to send application along with CV, copies of certificates, copy of PAN card, copy of Aadhaar card, and recent passport size photos to the email address given below.